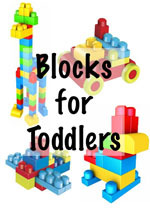 Blocks make wonderful toys for toddlers because they encourage problem solving and creativity. Our Mega Bloks set is one of the go-to items for both our 3-year old and her younger twin brothers, who are just beginning to walk. The pieces, first of all, are durable and too large to pose a choking hazard. They’re colorful as well, enough that a handful of blocks tossed on the couch will keep any of them entertained for a while. It’s a great way to work on fine motor skills and encourage open-ended play. We received the 80-piece set which includes a wheel base for building block vehicles. 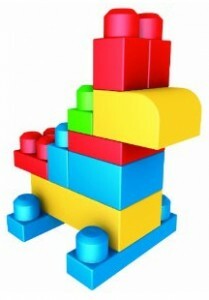 Between that and the different shapes and sizes of blocks, there are plenty of things to build. Tower of Mega Bloks. There are endless variations of these; this one looks rather like a parrot or tropical bird. 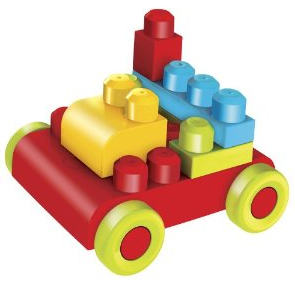 Build your own block car. 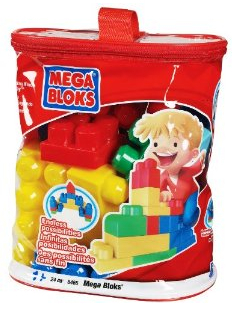 The cart base that comes with the 80 piece Mega Bloks bag has 16 pegs for building up your own toddler hot rod. Not big enough to ride on, of course, but fun to push around. Mega bloks giraffe. This cute animal design is on the front of the Mega Bloks bag. As I said we have the classic 80 piece set, which is enough, but tends to run out of certain kinds of blocks. 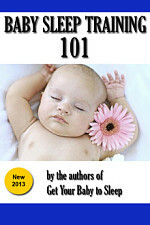 Especially when your little ones have a tendency to wander off with them. They tend to spread around the house, no matter how we try to keep them contained. The other day, I even found five or six in my laptop bag. When I was already at work. We’ve since supplemented our Mega Bloks with a smaller 24-piece block set with some new shapes and colors… these even had stickers on the side and were themed as exotic animals. They were fun and (of course) compatible with our main set of blocks. This is our set, the 80 piece large bag of classic colors. 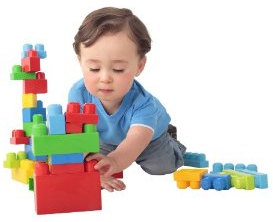 The bright, primary colors are engaging to infants and toddlers, while the different block sizes provide plenty of building options such as the ones shown above. And even though it shows a boy on the front, our 3-year-old daughter loves the blocks just as much as our boys do. 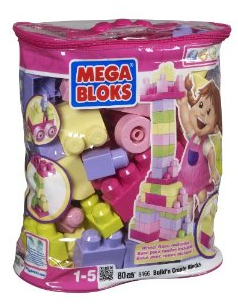 Here’s the same 80 piece large bag blok set but in pink colors for little princesses. It includes the wheeled car base as well. The blocks are identical in shape and size, but personally I find the colors less stimulating. Still, if the rest of the room is already pink for your girls, why buck that trend? And surprisingly, this set is often a bit cheaper on Amazon.com than the primary colors set. This smaller set includes 24 pieces and is a great starter set for Mega Bloks, or to expand an existing collection of +1 Mega Bloks. 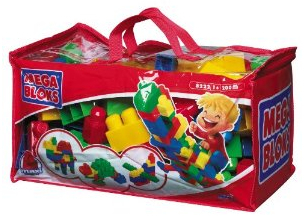 They’re in primary colors with a couple of unique pieces (such as the triangular peak) that can expand your building options.This set comes in a bag measuring 10″ by 8″ by 5″, so it’s is also nice on its own for travel or play in small spaces. 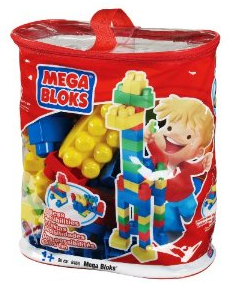 Here’s a great option for twins, multiple children, or if you just want to be able to build something really big: 200 Mega Bloks in a zip-up duffle bag. This larger set comes with some bigger block shapes; the possibilities are truly endless.The duffle bag is more durable than you’d expect, and makes a great carrying case that you can throw in the trunk or (if expecting company) shove into a closet. One of the best features of the Mega Bloks line is the growing fleet of vehicles and toys that are compatible with them. So far, we’ve collected a couple of dump trucks, a fire truck, and a few other vehicles that include posts for Mega Bloks. In most cases, you only have 3-4 “button” size spots to add blocks, but you can really build onto that. Also, certain vehicles like the dump truck have a big cargo area where you can pile the blocks in. It’s a great way to get the kids involved in “clean up time” as well! Here are a few of the best Mega Bloks vehicles. 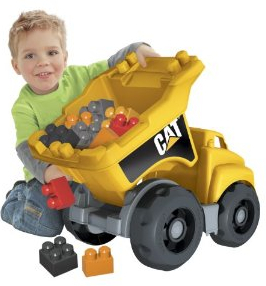 Here’s a Big CAT dump truck with a moveable bin that tilts to dump out the blocks. It also has three spots where you can add Mega Bloks to build on top of the truck. A great toy for developing both gross and fine motor skills! How cute is this little pink bus? It includes a driver and an open area in the top for 2×2 Megabloks. 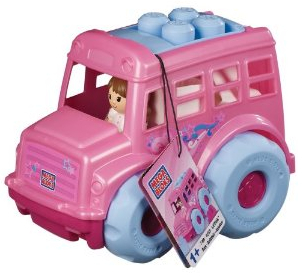 A great little toy for pushing around and playing “school bus driver”. And it’s color-coordinated with the Mega Bloks pink block set I reviewed above. If you’ve ever watched Thomas & Friends then you start to learn all of the characters’ names. Harold is easy to remember – he’s a helicopter. 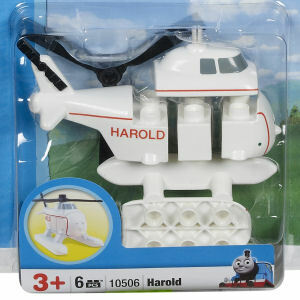 Now there’s a buildable version of Harold the Helicopter from Mega Bloks. If your toddler loves Thomas & Friends or just helicopters in general, this is perfect.